With the events of this week (US elections) I needed peace and quiet, certainly not more noise in my life. Besides, I wanted to build up my expectations for the Dark Tranquillity concert I got a chance to attend on Sunday, so by design I stayed away from heavy music. Searching for something ambient I glanced over the description of Myrkur's Mausoleum and figured it would do. I was surprised to see something like Mausoleum on Relapse, but didn't give it much thought at the time. Admittedly, I was absolutely ignorant to the whole drama surrounding the true face of Myrkur, the pop black metal label attached to it, the fact the only driving force behind Myrkur is a Danish born NYC female resident Amalie Bruun. 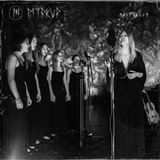 Having done research now, the fury surrounding Myrkur's full album M split many fans along the lines of the album being either revolutionary or a total gimmick. Mausoleum compositions then is many of M songs deconstructed, reducing them to naked acoustic skeletons. Amalie Bruun, dreaming herself to be an ancient goddess, has a good enough voice, in spots visceral and primal, to stand there all alone, in a cavernous claustrophobic chamber, delivering meditations live. When she needs support, her voice an escaping breath in Byssan lull, it comes in a form of a famous Norwegian all-girl choir known as Det Norske Jentekor. Voice modulations bouncing off the cold walls (Volvens spadom), some of these compositions are epitome of freezing serenity, yet they do pack an emotional punch (Jeg er guden, I er tjenerne). I loved it more though when on some versions of the Mausoleum songs dark piano and strings are allowed to build up melodies, adding depth, turning Skogen skulle do and Den lille piges dod into delectable pieces. Bathory's cover of Song to Hall Up High breaks up the slight tediousness which sets in towards the end. Cold, withdrawn and calm, Mausoleum is not metal in a slightest, it is Norse ambient darkwave instead, and it was exactly what I needed to stay alone with my thoughts this week.